Interview with Kit Galloway, co-founder of the Electronic Café with Sherrie Rabinowitz ::: Monday, April 24: 9:00pm-10:00pm (EDT). Networked Conversations is hosted by Randall Packer ::: live & online & global via Internet chat. Kit Galloway and Sherrie Rabinowitz are widely recognized pioneering artists of communications art. They were among the first artists to begin exploring tele-collaboration with satellite technologies in the 1970s, including their masterwork Hole-in-Space from 1980. 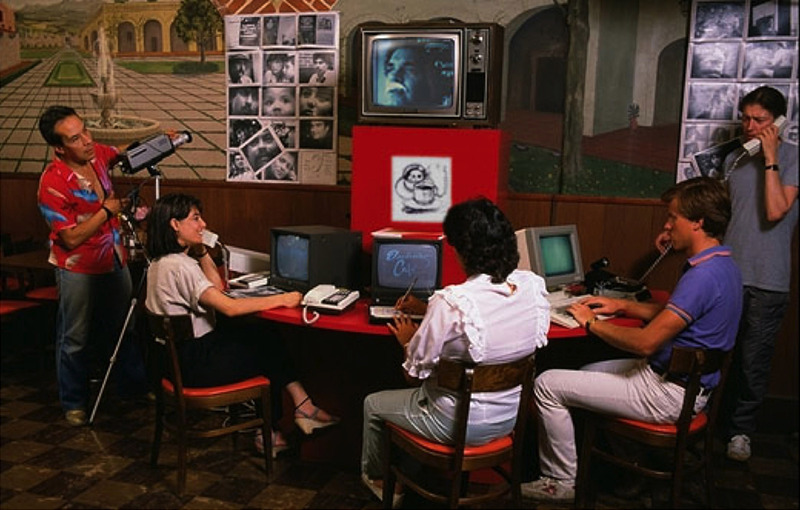 In 1984, they founded the Electronic Café, a project commissioned by the LA Museum of Contemporary Art and Olympic Arts Festival, joining cafés and restaurants that connected culturally diverse communities in Los Angeles. People at the sites exchanged drawings, photos, poems, video and fax messages via a dedicated network: nearly ten years before the Web became a mass medium. The artists’ commitment to using technologies to enhance community interaction led them to establish the Electronic Café as an ongoing cultural incubator in Santa Monica, California, where it became internationally known as an influential hub for dialogue, exhibition, and performance dedicated to networked art. Networked Conversations is a series of live, online interviews hosted by Randall Packer, a presentation of the Third Space Network. The series features media artists, curators, writers, and activists discussing a broad range of topics at the intersection of social, political and aesthetic issues relevant to net culture. Networked Conversations collapses geographical and cultural boundaries via participatory Internet chat, and is free & open & accessible from anywhere in the world.